On Palm Sunday (April 24), Volodymyr Omelian leaves his wife at home with their young son and goes to work. The minister travels around the city in a Volvo S80 car of the 2008 model year, but in spite of his love of cars, he considers a train journey through the mountains as his most memorable trip. According to him, like many people, he was once late for a train and twice late for a plane and it was a complete disaster because it was his son’s birthday. However, the Infrastructure Minister never traveled without paying the fare. "The basic thing that I was taught is decency. Therefore, even if I entered a railcar and I had no ticket, I ran in search of the conductor to buy a ticket, and those three minutes were wild terror for me," Omelian said, sharing his memories. The minister’s office is located on the fifth floor. The office has not changed since the departure of the previous infrastructure minister Andrii Pyvovarskyi – he inherited the paintings and furniture from his predecessors. What catches the eye is an empty space on the wall, where a travel card once hung. Omelian says he only brought photographs of his family, which he placed on a table, into the office. Speaking of the previous minister, he did not seem burdened by the weight of his important post at the last meeting about a week earlier, during which he was cheerful and smiling. He joked and talked about a street food festival. After his vacation, he gave himself four weeks of reflection before deciding where he wanted to be, but he said it would definitely be in business. Pyvovarskyi positioned himself as a technocratic minister. Omelian says he will work hard with parliamentary deputies. "If need be, I will pitch a tent near the parliament and walk around like a Jehovah's Witness to explain the importance of adoption of a document to every parliamentary deputy," Omelian joked. However, there is an element of truth in every joke. Pyvovarskyi failed to find common ground with parliamentary deputies, something he often discussed. Therefore, pushing through legislation and working with parliamentarians are two of the main challenges for the new minister. Asked whether a minister should be a technocrat or a politician, Pyvovarskyi answered without much hesitation that a minister should be a technocrat and added that he had the impression that parliamentary deputies were happy to see a new face in the ministry and were ready to start all over from scratch. Omelian says that, for him, it is important for a bureaucrat with 17 years of experience to show that bureaucrats are also capable of implementing reforms. Time will tell whether Omelian will be able to combine the attributes of a politician and a technocrat successfully. However, in an interview with the CFTS, he said that reform of the maritime and railway sectors were among his main tasks. Do you remember the anecdote about three envelopes? The first envelope contained the phrase "blame everything on me." What was in the envelopes that Pyvovarskyi left you? Firstly, I would definitely never have used the first envelope. Secondly, Andrii did not leave me any envelopes. I believe that we have a very good relationship, and we always discussed all the problems honestly. Yes, he sometimes had to keep quiet, just as I have to keep quiet. However, there was often mutual understanding, and I am very happy about that. I know about cases in which you come into an incomprehensible situation with empty offices, empty computers, and without transfer of cases after a change of team. However, I always transfer cases when I quit. Everything is different in this case and things should be easier for us because we are not arriving in a foreign environment. We are in a normal team, and we have some preliminary work that want to develop further. Therefore, Andrii did not leave envelopes and I will not. Were there any parting words? He simply said, "Hold on." Was it easy for you to make the decision to accept this job? What inspired you to accept it? I do not want to pretend that I absolutely did not want this job or that I was forced to take it, etc. Yes, I wanted this job and I believe that I am ready for it. I have nothing that is unacceptable to society and I do not have my own business. I deliberately refused all contacts with friends who might lobby for their interests because I realized that this would be harmful. I try to be guided by the idea that decisions should be made in public without the fear of unpleasant issues and the fact that everyone can have his or her own point of view. Having laid the proper foundation, we can create something. Nothing good will be achieved if you start with falsehood or lies or by imposing your own will. My role as a minister is to provide a vision of the future and lead people forward. I am aware that this is not some kind of startup, where one can say ‘Well it did not work out; well, were are bankrupt; well, let us try something else.” This is about the fate of the country, and it is necessary to take a responsible approach. At one of our meetings, you said that you passed a round of interviews before you were appointed. With whom exactly do you speak? I spoke with the leaders of all the political parties in the parliamentary coalition. I had a meeting with the parliamentary deputies in charge of the transport industry. By individual MPs, whom do you have in mind? Did you speak with the head of the parliament’s transport committee, Yaroslav Dubnevich? There is no point in listing their names now. There is a common mission – to restore order in the country, and we should start with infrastructure. On my part, I guarantee everyone decency and understanding of the processes. On their part, they must guarantee support for me. Against this background, we are working together and if we reverse the situation – change the situation on the railways and implement reform of seaports and the maritime industry – I think it will be a good thing. No. More than three: the Ministry of Foreign Affairs, the Ministry of Economy, the Ministry of Finance, the Ministry of Environment, the Cabinet of Ministers... This is at least the sixth. Well, you have been here for more than one year. Do you feel like a transporter worker? Well, you know... I really live the problems of the industry. Frankly, if I do not sleep well, it is only because something bad happened while I am sleeping. I am not a career transport-industry worker and I have not worked in this industry all my life. Am I ready to wear a helmet and make myself a railway worker, for example? No, I see my function primarily as that of a manager. Recently, there has been particular interest in infrastructure issues in society. Everyone has heard about low-cost airlines, the railway, etc. To what do you attribute this interest? Have people developed a better understanding of transport problems? No. In principle, everyone in this country comments on everything. I also have many ideas regarding the global order in the world, but I keep those ideas to myself because I believe that I am not competent to comment on energy or political issues. It is not that people are interested in the status quo; they are rather irritated by it. Bad roads, poor services, poor performances, boorish attitudes, and many restrictions, which take time, steal your money... My task is ensure that the government gets out of the lives of citizens as much as possible and that we do not interfere but only facilitate. 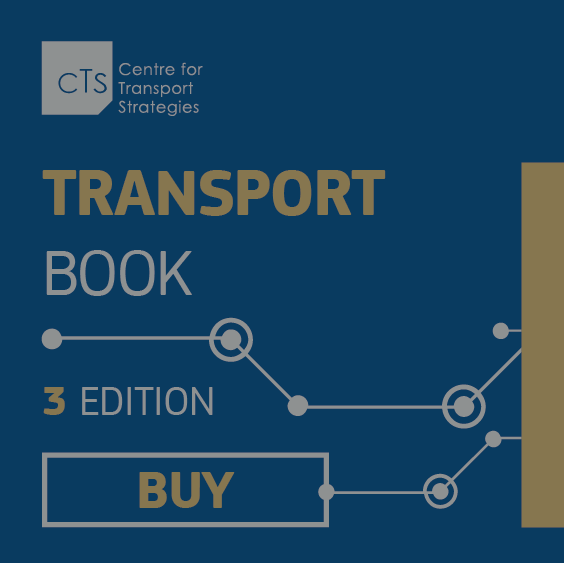 On which three pillars should the transport industry stand? The first is personnel appointments. Good results can be achieved with high-quality people. Last year’s decision to bring "fresh blood" into the Cabinet of Ministers was the right decision. Now, we must bring fresh blood into the industry. We should not be afraid to take risks if the risks are justified. So far, the appointment of Wojciech Balczun is about image, and it looks like a risky decision, but it is the right step. I know that this step is very welcome among railway workers. The second is the ability of the elite to be self-limiting. If they are willing to give up part of their super-profits, we will take a step forward. The third is that businesses should operate within the legal framework. A country cannot develop normally when there is a shadow economy. However, businesses also need to say aloud that they are no longer satisfied with the monopoly of two or three elites. We should created a middle class. If this happens, then everything will be all right in the transport industry. You said that you would create your team before the end of the week. Can you say who will be the first deputy minister and whether Vaskov, Reiter, or Snitko will remain? Let us do it this way: when personnel appointments are made, we will all join hands together and come out to address the press. For now, I am not ready to answer this question. In fact, there are key issues: I want to finish the corporatization of the Ukrzaliznytsia public railway company and the Ukrposhta postal agency and the reform of seaports and the maritime industry. I would like the Ministry of Infrastructure to be the first ministry to sell state assets that are not strategic and are simply sources of informal profits. Another important aspect is the fight against corruption. In reality, it should actually be that regulatory function of the ministry, which people forget about. We must steamroll all corrupt people. I think my wife would be super happy if that were the case, but the issue of salaries is a disaster. There are hopes that the issue of creation of a fund for remuneration of officials will be resolved by the Law on Civil Service that will enter into force on May 1 this year. However, let us move from the future to current issues – for now, everything remains unchanged and looks quite sad. Under the new law, there will be an increase in wages for specialists. According to our calculations, the spread is UAH 4,000,000-6,000,000. However, that will also not change the situation. I understand that I cannot fill the ministry with volunteers. Therefore, we consider salaries, including salaries for top management, a very urgent issue. This has been achieved in state-owned enterprises, but not yet in government agencies. We proposed the Ministry of Infrastructure as a model ministry for trying high salaries to see the result, but the proposal was not accepted. I understand that we have a serious shortage of personnel throughout the state system because of that. Many people have left the Ministry of Infrastructure and many more will leave because they cannot live on such money. That is also a brave step on their part – instead of succumbing to temptation, they are honestly saying, "We cannot, we are leaving." In the second part of the interview, we ask Omelian what he expects from Ukrzaliznytsia’s head Wojciech Balczun, whether there will be concession highways in Ukraine, and to whom he "made an offer" in the Ukrainian Port Authority.